The show’s finally getting around to the contests, but as we could have figured, that’s not the focus of the series, it’s just a means to an end. 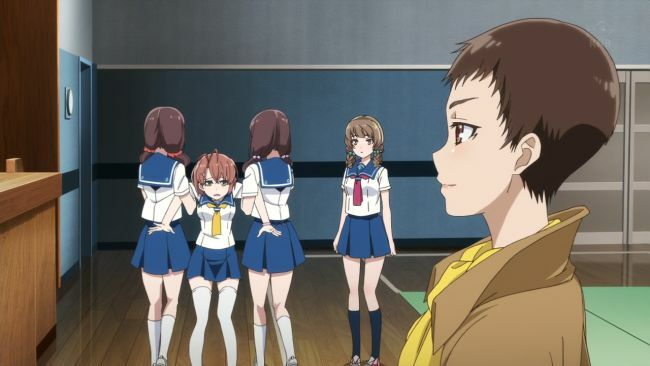 It’s so not a focus that they’re not interested in showing them at all, but rather getting us more of Haruta and Chika learn about the world of adults. What the Hell is Haruta Doing? The main thing in episode 10 was the big dog. I think everyone watching the show thought, when Chika said Haruta smelled like a beast, thought that Haruta was sleeping with the farm animals again. And then when he walked out with that big Tibetan Mastiff, a dog that seemed about as big as the mountains in the country it’s named for, you wondered if he’d been sharing a house with it. But instead he had just found it recently, and was hoping to reunite it with its owner. But it’s never that easy, as two claimants show up and say that it’s their dog, a 20-something guy and a young girl. Haruta and Chika go through some effort to choose between them, but it’s no use until Kusakabe-sensei shows up and decides that the dog belongs to the girl. This one was a lot less believable that he knew anything about the case, even though he ended up being right. It even seems a lot more plausible that the guy who wanted to steal the dog would just do it while Haruta was not with the dog, rather than going to the effort of picking up poop and stuff to try to prove it was his dog. But that someone would go to effort to take something that wasn’t his (and would be tough to actually realize any monetary gain from) was just one of the lessons, with the other one being that sometimes there are some really tough divorces. And as we can probably figure, it’s can be a lot less ‘nice’ to get divorced in Japan as opposed to North America or Europe. There’s can be a lot of social stigma, because while they have a ‘Divorce by Mutual Consent’, they mention in this episode that it was an arbitrated divorce, which means someone was at fault, and that there was a strict agreement that both parties are forced to abide by. Even worse, there is no shared custody in Japan, and visitation is not considered a right for the non-custodial parent. So this little girl was forced to live with her father and cut off contact with her mother (and we shouldn’t necessarily infer that the father is a bad person. If custody had gone the other way, then the same rules would have applied in reverse). But everyone realizes the chance for the girl to visit her mother if it just ‘happens’, or the effort is made by the girl. Who is this mysterious clavietta player? We haven’t really gotten much information about Kusakabe the whole series. Yes, he gave up his former life in music and is now teaching at this out-of-the-way school, but that’s it so far. But this time an enigmatic woman shows up to practice with her melodica, challenging Naoko to a music contest about the out-of-tune piano (and for the record, an out of tune piano is a pain to play, it just sounds wrong). But Makoto Yamanobe’s real goal is to talk to Kusakabe, who was the prized student of her grandfather. Apparently so prized that he got plenty of excuses made for him, such as when he abandoned his conducting position in Europe, with no explanation given. Makoto, being the one who frequently had to make those excuses, certainly has a bit of a chip on her shoulder. But now she’s asked by Kusakabe to help with another issue: the sale of a Bosendorfer Imperial, once considered to be the “Rolls Royce” of pianos. With 97 keys, 9 extra all on the bass end, these instruments are felt to have a richer sound due to the harmonics of these low strings, even if they are rarely played. Her grandfather’s will states that she’s the only one he told the location of the key of the piano, and they want to have it to protect the value when auctioned. However, like the earlier episode about the apartment building, Makoto is convinced that her grandfather was having her on, playing a trick on her by cruelly never letting her play the prized piano (a privilege that he did extend to Kusakabe), even though she was considered to be the ‘genius’ piano player, and really has no idea where the key is, having only been left the melodica, which has been taken apart for repairs multiple times without revealing a key. However, the real twist is that much like Naoko (finally dubbed Nao-chan by Chika), Makoto has been fighting against the loss of one of her senses, being able to see. She can no longer read, and that’s why she gave up the piano. And in a moment of comisseration, she breaks the painful truth to Naoko: Even if she were to become someone of importance in the music world, it would always be modified by “… for someone who has lost her hearing.” I’ve talked about the extraordinary difficulties of a life in music in my posts before, but for someone who wants to be successful in their own right, it’s an added burden to that. “Is my success only out of pity? As a parlor trick or carnival act?” How can you tell the truth? And it’s something that Naoko is having to think seriously about, since she’s only trying to be good at music to leave her father’s house, something you’d think she’d be able to do with some other, more achievable, goal. And again like that earlier episode, the last piece to this current puzzle of ‘where is the key’ is solved by Haruta realizing that the grip on the clavietta may hold a message, being partly discolored like the keys. A message in braille for his granddaughter, admitting only to her the uncomfortable truth that he had lost the key to the Bosendorfer. But the reason for keeping it locked is also discovered when the lock is disassembled: the prized original ivory keys had been replaced by ceramic, and the ivory ones used in the clavietta he gave to Makoto, a little bit of grandfatherly love and remembrance at the expense of the Bosendorfer. Two more stories about the realities of adulthood, one more direct than the other, but both a bit sobering. But the show does manage to stay upbeat enough, because these aren’t life destroying things. And it could be said that the exposure to these kinds of trials in life will help in the future for these kids, knowing the things that can come along, and that people can and do live through them. Although it would be hard to say that Makoto is having a particularly successful life, not having eaten for a few days. But a traveling troubador is probably not going to have the best life anyway. She’s still alive, tho, and seems at least somewhat happy, if bitter about always being the one to apologize. For the first episode you’ve covered, I couldn’t help but think of Mouse from the novels of The Dresden Files. I don’t think that Pie is descended from a Temple Dog, that would have been from another PAWorks series. I think this is the underlying theme of the whole episode, if not the whole show. Conventional thinking is one thing, reality as it marches on may not resemble that at the best of time…. Should I bring up the tuna piano joke?